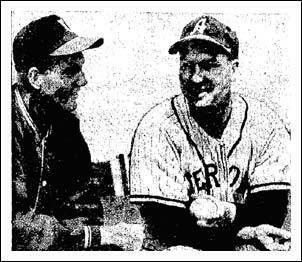 (Left) Huron Elks' starter Andy Swota (who had pitched in Saskatchewan at Carrot River and North Battleford 1950-1952). The veteran is working on his Master's Degree at Illinois-Southern University. 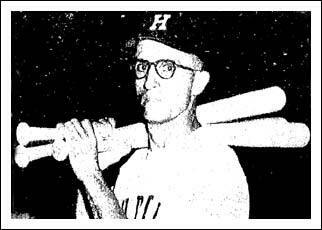 His 4.00 ERA in 1955 was 4th best in the league. (Right) Hank Ertman, Huron playing-manager, receives congratulations on his first homer of the season. That's shortstop John Hunton at left and Connie Juelke's right hand in the picture. (Left) Watertown pitcher Ted Berner (left) talks strategy with Lake Sox manager Kermit Wahl. Berner, from the University of Utah, would later suit up in Lloydminster the following season. (Right) An advertisement in the Huron, SD paper, The Huronite and The Daily Plainsman. 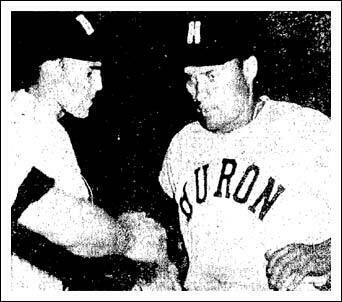 (Left) Dean Scarborough of Huron, the Elks' handyman, playing just about everywhere and providing a big bat for the club. 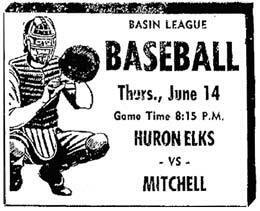 (Right) Second baseman Ed Bowman, Huron, shows off his fielding form. 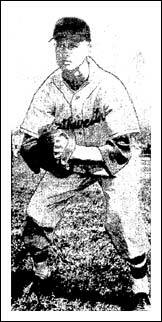 Paul Dean Jr. was one of the sons of some famous baseball names to suit up in the Basin League in 1956. Dean, the son of former Cardinal great Paul and nephew of Dizzy, was joined by Dave Moriarty, whose dad George is a scout for the Tigers after playing for and managing Detroit and a career as a major league umpire. Freddie Lindstrom Jr. is the son of the former NL third baseman-outfielder. Dean is seen (above left) pitching for Chamberlain and (middle) signing a letter of intent to enter Southern Methodist University. 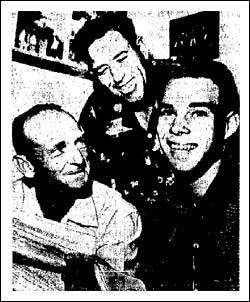 Dean is seen with his father (middle) and Alex Hooks (left) the SMU baseball coach. 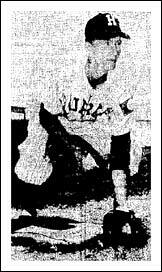 Dean averaged 13 strikeouts a game in high school in the spring of 1955. 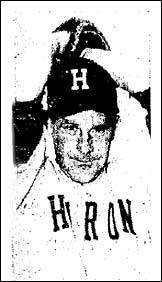 Right - Ed Broeker, Watertown Lake Sox star of 1956 was the Big Ten batting champion in 1957. The captain and shortstop of the Northwestern nine batted .440.